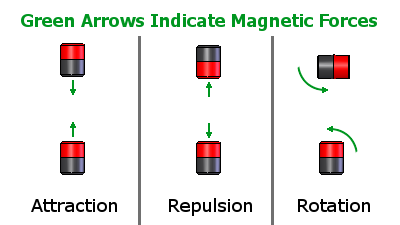 Did you know that two magnets don't just attract or repel each other? Depending on how they are positioned, they can also impart a twisting moment on each other. This month's article on Magnetic Forces describes these forces, why magnets behave like this, and when to expect this twisting moment. When you place opposite poles near one another, they will attract towards one another. For this discussion consider our D68PC-RB plastic coated magnets, which use two colors to indicate the poles. The red is the north pole, the black is the south pole. Put the red end of one magnet near the black end of another to feel the attraction force. When you place like poles near one another, the two magnets will repel one another. You can do this with red-to-red or black-to-black. Magnets not only exert a force on one another, they also can exert a twisting moment as well. If you have a single magnet in free space, the magnetic field looks something like the image at left. The color is related to the strength of the magnetic field, while the black lines of flux indicate the direction. At any point around the magnet, the magnetic field is parallel with these black lines. If you place a second magnet somewhere near the first, you can feel a twisting torque on it that tries to align the magnetic fields to one another. The faded images of other magnets shows how a second magnet “wants” to be oriented. If the magnet is not aligned this way, it will feel a torque or twisting moment that tries to rotate it. If opposite poles are next to one another, magnets will attract while positioned side-by-side. If like poles are next to one another, magnets can repel while side-by-side. Generally, the force you see in these side-by-side cases is lower than the pole-to-pole forces. We are often asked: What is the lateral pull force of a magnet? Our Magnet Calculator estimates the force from a magnet to a steel plate or to another magnet (Pull Force), but that’s the force towards the steel plate or magnet. This is often called the normal force, because it acts normal (perpendicular) to the surface of the magnet. What about the sideways or lateral force? With a magnet attracting towards a steel plate, there is no lateral force. That’s right, the magnetic force only pulls straight towards the plate, normal to the surface. If you have a magnet stuck to a vertical steel surface, like a refrigerator door, there is no magnetic force opposing the downward pull of gravity. What keeps the magnet from sliding down? Friction. The strong pull towards the steel surface helps increase friction, which resists the downward pull. Learn more in our earlier article on How Much Will a Magnet Hold? With magnet-to-magnet attraction, you can feel friction forces when trying to slide two magnets apart. 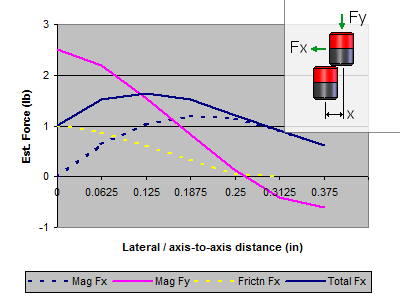 That’s why our rubber coated magnets are so hard to slide apart – increased friction! You can feel a lateral magnetic force when two magnets are offset from one another. The graph at right shows an estimate of the lateral magnetic forces between two magnets. 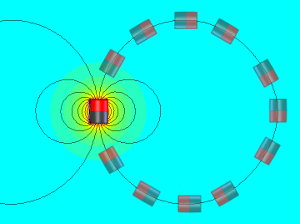 The lateral magnetic forces are shown in the dark blue, dashed line. The solid blue line is the sum of the magnetic and friction forces that act in the lateral (x) direction. While exact answers depend on a lot of factors, we usually figure the force required to shear a magnet sideways off another magnet will be less than the listed Pull Force, Case 1, perhaps about half of that value. Some magnet shapes can be used as a magnetic compass if placed on a flat, smooth, non-magnetic surface. Because the D68PC-RB cylinder and D84PC-RB disc magnets have sides that are slightly angled, they work well for compass demonstrations. The red end points towards the Earth’s magnetic north pole. Learn more in our article about Which Pole is North?